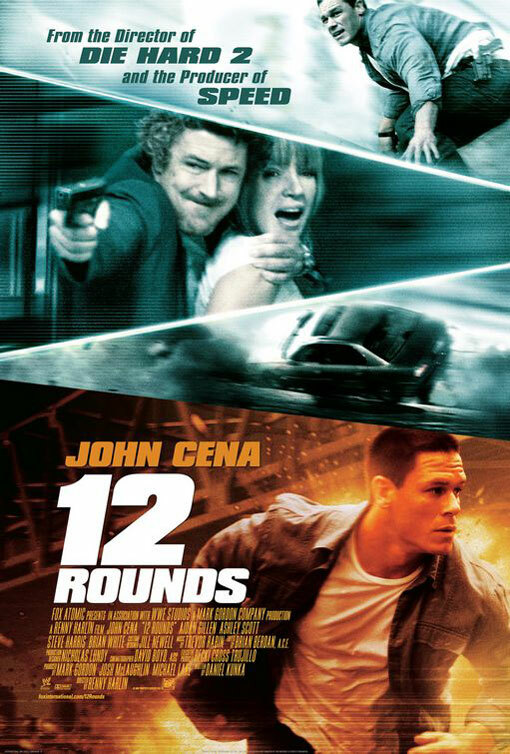 I often watch movies in 20-minute chunks while I eat breakfast, and while this sometimes creates a somewhat disjointed effect it is also the only practical way for me to consume cinematic material on a regular basis. Recently a friend of mine suggested, in response to a Facebook post asking for suggestions of a good anime film, that I watch Grave of the Fireflies. But, he cautioned, I should do so all at once instead of breaking it up into segments while I munch on rice krispies. 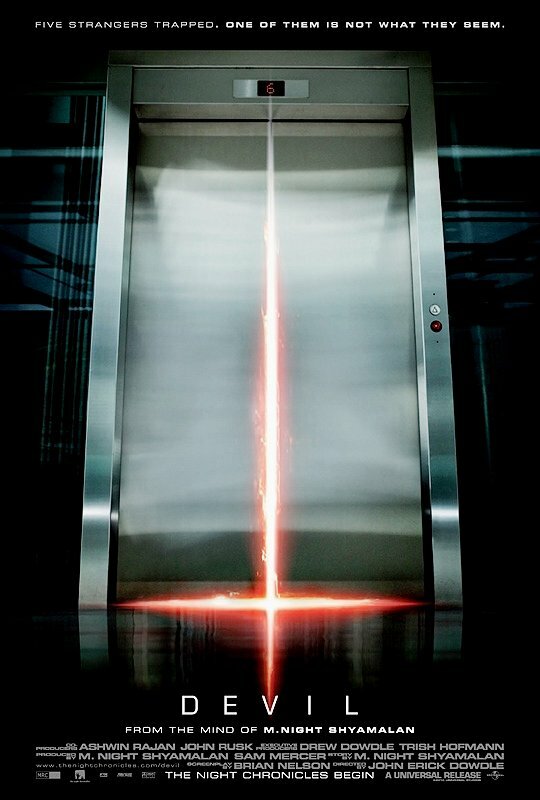 And so when I was at a conference recently I decided to shut out all distractions in my hotel room and focus solely on this movie while I watched it in its entirety. Turns out my friend was right, and I was treated to one of the most engrossing tales of humanity ever committed to the silver (or, in the case of me and my laptop, LCD) screen. Grave of the Fireflies is a heart-wrenching tale of devotion and despair, and one of the saddest movies I have seen since Schindler’s List. The opening words, spoken by young teenager Seita, set the tone for the rest of the movie: “September 21, 1945…that was the night I died.” We then see him, bruised and hungry, as he lives out his final moments in a dirty train station. The rest of the story is told in flashback as we see Seita and his young sister Setsuko and how their lives are transformed during the allied bombings of Japan during World War II. 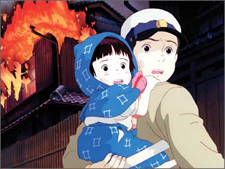 Since the outcome is never in question, the focus of the film is shifted to the relationship between the two children as Seita struggles to care for his sister in the wake of their mother’s death during an air raid. Seita and Setsuko reveling in the simple joys of childhood. And what a relationship it is. Though the two characters are colored drawings, they possess a deep humanity that is rarely seen in any movie whether live-action or animated. The focus of the movie is on the simple moments that reinforce the love that Seita has for his sister, and the degree to which she depends on him for everything she has. They play in the ocean, eat fruit drop candies, gather supplies for their makeshift shelter by a river, and catch fireflies in the moonlight. Through it all Seita will do anything for his sister, sacrificing whatever he has and doing whatever it takes to get her the food and care she so desperately needs. And that’s about it: no conspiracies, no double-crosses, no hidden agendas, just a boy determined to care for his sister in the face of incredible odds and dwindling resources. And even though we are fully aware of what will happen (to Seita, at least–the fate of Setsuko, though predictable, is not shown until the end of the film) we can’t help but be thoroughly enraptured with this simple tale of innocent care and affection. In fact, I kept on expecting another shoe to drop: when a group of children stumble across their shelter, my American movie sensibilities were bracing for the worst: they would surely burglarize or vandalize the shabby campsite, leaving Seito and Setsuko even worse off than before. But such conventional narrative tricks are nowhere to be found here, and serves to elevate Fireflies far beyond the level of typical cinema. War, as seen through the eyes of a child. After Seita and Setsuko leave their hometown of Kobe they go to live with their aunt Akemi, and I found this to be one of the most frustrating segments of the narrative as Seita refuses to help out around the house, secure employment, or otherwise help the war effort of his native country. After several sharp rebukes from Akemi, he decides to take his sister and seek shelter on their own–a choice that eventually leads to tragic ends for both children. If only Seita had been more responsible, if only he had listened to his aunt, if only he had sought medical care for Setsuko sooner…if only. And yet my frustration at the well-meaning but ultimately tragic decisions of Seita reinforces the strength of the film as a whole, as these flaws only served to draw me deeper into the story. The simplicity of the story allows for a deep emotional connection to develop between the viewers and the characters: sometimes Seita makes some fairly dumb decisions, and I found myself growing frustrated and irritated as I watched. Setsuko is one of the most convincing young children I have ever seen in a movie–animated or live action–and the impeccable voice acting perfectly complements the stunning animation. 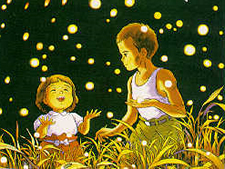 Metaphors abound too: from the fireflies, which burn bright but reach the end of life so quickly, to Seita himself as a representation of Japan and her stubbornness to admit defeat in the face of overwhelming opposition. I am not a soldier, and from the comfort of my living room which I so freely enjoy thanks to the ones who have bravely served in the line of duty, I am hardly in a position to make any sort of political statement on the validity of war. 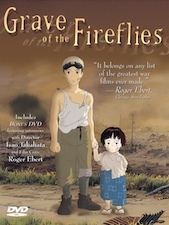 But having seen many, many war films from Bridge on the River Kwai andThe Great Escape to Platoon and Saving Private Ryan, I can say that Grave of the Fireflies stands toe to toe with the greatest war films of our time, and possibly even since the inception of the medium. It is a profound and deeply personal tale of how the hardships of war can affect the deepest of human connections. As a side note, I cannot stress how important it is to see this film presented in Japanese. The voice acting is absolutely superb, and the American voiceover, as is the case with most anime, strips the film of much of its emotional weight.